A Brief Discussion about CCD Technology by S.B.I.G. SBIG Large Format Camera Head in .pdf format, 80,889 bytes. SBIG Large Format Camera Head with Nikon Lens Adapter in .pdf format, 71,596 bytes. SBIG Large Format Camera Head with 2 Inch Diameter Male Nosepiece in .pdf format, 69,752 bytes. 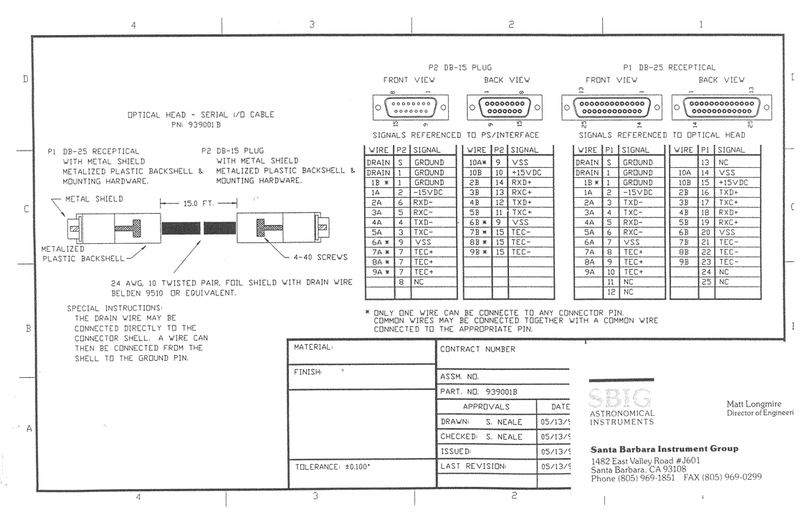 SBIG ST-6 Series Camera Head to CPU Cable wiring arrangement with pins assignments, in .jpg format, 272,038 bytes. Operating Manual for Research Camera Models: STL-1001E, STL-1301E, STL-4020M, STL-6303E and STL-11000M Complete 84 page document in .pdf format. File size is 2,502,950 bytes.